The primary objective of this project is to research technologies and develop equipment that will permit information to be gathered and exchanged while planning, and during the execution of, a response to a serious incident in an underground coal mine that could jeopardise the lives of personnel in the mine and the future operability and profitability of the mine. Furthermore, this will be achieved even if the incident has rendered the mine’s operational power and communication networks inoperable. First and foremost, in the sense that it is an enabling technology for other techniques to be developed in the project, it is a key objective to conduct research into resilient methods of communications that are independent of fixed networks. Two methods will be investigated, one that operates through rock without the need for a cable and the other which requires a cable, albeit one that can easily be deployed by rescue personnel following an incident. In addition to being a requirement of other initiatives being developed in this project, these communication methods are eminently suitable for person-to-person communication during an incident response. The second objective is to develop various types of sensor. Unlike previous sensors developed in several RFCS projects, though, the sensors to be developed here have features which are unique to the requirements of this project. One such requirement is for sensors, that can be fitted in key areas of a mine, that are resilient to the aftermath of major incidents, the most serious such event surely being a shock wave progressing down a gallery because of an explosion. Methods of protection will be investigated, including the fitting of the sensors into recessed, explosion-proof pods. Another aspect will be the adaptation of a small range of environmental sensors and thermal imaging cameras that can be carried onboard the drones or other autonomous vehicles, which due to the requirements of high manoeuvrability and long battery life, permit only a small payload to be carried. A third objective is to investigate means by which small unmanned vehicles can be used to investigate areas of a mine that have been affected by an incident before committing personnel into those potentially hazardous regions. Technologies that will be investigated include unmanned aerial vehicles (UAVs) colloquially known as drones, climbing robots, and crawling robotic vehicles that could pass through falls of rock. 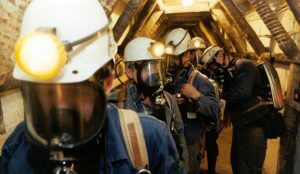 The technique of collaborative (otherwise known as swarming) vehicles will be employed to cover large areas of a mine in a reasonable time. Following initial research, it is an objective to build a prototype unmanned vehicle system. A fourth broad objective is conduct research into several mechanical technologies that will be able to facilitate the passage of autonomous vehicles to collect information from, and to allow communication to, areas of a mine cut off by incidents such as falls of rock or explosions. In particular, investigations will be carried out into novel methods of drilling, either through solid rock or through rubble, and into means of supporting the newly drilled tunnels. It is an objective that such equipment is small, light and portable and, in the case of the drilling rig, is highly efficient so that it can be powered from its own internal batteries. It is also an objective to conduct research into several key initiatives to support the work described so far. Included here is a vehicle processing hub that forms the control and information exchange centre for the small unmanned exploratory vehicles. Also, a remotely-controlled vehicle that can be used, during an incident response, to transport mechanical equipment such as drills and roof supports to the affected area of the mine, will be developed. To augment the live data that will be provided by the forgoing initiatives, it is an objective to develop software models that will allow this live data to be augmented with simulated results. 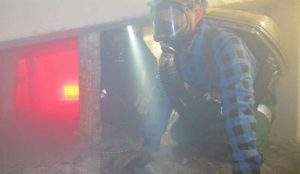 An advanced method of evacuation modelling using an agent-based approach will be created, for use while planning a rescue, to determine the most likely location of any missing miners. In addition, an advanced environmental model will be developed, using computational fluid dynamics (CFD), to provide additional information on probable temperatures and other environmental conditions, and assessing the risk to personnel. This will be used before committing rescue personnel, or deploying the small unmanned vehicles, into potentially hazardous areas of the mine that have been affected by the incident.